I was lucky enough to inherit three cast iron pans from my mother’s collection when she passed away, having asked her for them years ahead. After all, with three daughters she was bound to think of splitting them between us if I hadn’t expressed an interest. I was twice blessed with another “gift” of two more skillets from a student who was throwing them away because she thought they were ruined. Yes, they had been improperly taken care of so they were rusty and looked terrible. When I saw them by the door ready to go in the garbage, I asked if she wanted me to show her how to save them and the response was, no you can have them. Lucky me, I thought, as I whisked them away and now I have five beautiful seasoned cast iron skillets. I rarely use my stainless steel pans anymore after discovering what a joy this cookware can be. 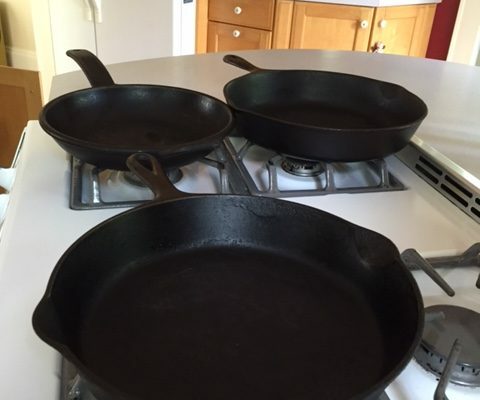 Here are the simple steps to purchasing and taking care of cast iron. First, if you can find them at garage or yard sales you will be a lucky person because more than likely they are old and already well used. This is one pan that gets better with age, and as the years go by, becomes a best friend. If you aren’t into searching the streets for yard sales and would rather buy one today, any cookware store sells cast iron, as they are now back in style. The best ones are Griswold or Lodge, although Le Creuset and Calphalon make them as well. When you purchase a new one, they are already “pre-seasoned”. You will still have to prepare for ease of cooking, it will need seasoning no matter what the label says. This is how I treat a new cast iron pan. Scrub it with a thin layer of kosher salt to remove any particles or impurities from the surface of the pan. Wash it well with hot soapy water and dry completely. Then add a thin layer of flavorless oil (anything such as vegetable, peanut, grapeseed, or flax seed) so it coats the entire pan, including the sides, and remove the excess oil with a paper towel. Place in a hot oven (450) for thirty minutes until smoking and turning black. Turn off the oven and allow the pan to cool completely. Repeat this process until the pan turns very black and has a smooth finish. It can take three or four times. After it cools completely the pan is ready to use. When you are ready to cook, heat the pan on high heat for about a minute before you add any oil or fat, then lower the heat to medium, add whatever fat you are using and then heat again for a minute. Then add your food. Avoid excessive soap and acidic foods (such as tomato sauce or anything with vinegar or citrus) until the pan has built up a nice seasoning – where it looks smooth and shiny. My pans are all so well seasoned that I can cook anything in them without concern. I make tomato based sauces, scramble eggs, add lemon juice or wine without a care in the world. To take care of the pan, use it regularly, this will make the pan a joy to cook with as the built up layers will continue to season it. It’s easier to clean if it’s still warm as any food stuck to it will most likely slide out with minimal soap and water. Dry it immediately over an open flame- this is the most important step to avoid rusting and having to start all over with the seasoning process. Add a thin film of oil or cooking spray to your pan, (wiped out with a paper towel), before storing to keep it from coming into contact with any moisture. With these simple steps you will enjoy a fabulous pan for the rest of your life and hopefully pass it on to your children or someone you know who loves to cook.